The Eighth Karmapa, Mikyö Dorje was born to devoted yogi practitioners in Satam, a small village in the region of Kartiphuk of Ngomchu, eastern Tibet. At his birth, Mikyö Dorje spoke the words, “I am the Karmapa.” This led his father to visit the Third Tai Situ Rinpoche to tell him about their unusual child. Situ Rinpoche immediately knew that the baby was the reincarnation of the Seventh Gyalwa Karmapa. When Mikyö Dorje was five years old, another family from Amdo claimed that their child was the Karmapa. The Seventh Karmapa’s regent, Gyaltsap Tashi Namgyal Rinpoche, set out at once from Tsurphu Monastery to investigate the matter. When he saw Mikyö Dorje, he spontaneously prostrated to him, knowing very clearly that the young boy was the true Karmapa. Together with the Third Tai Situpa, he made both boys carry out tests. Mikyö Dorje not only passed all tests but also announced, “Emaho! How wonderful! Have no doubts. I am the Karmapa.” The young Karmapa recognised the other boy to be the reincarnation of Surmang Chungtsang from Surmang Monastery in East Tibet and made sure he was cared for. At six, Goshir Gyaltsap Rinpoche gave Mikyö Dorje all possessions from his previous life and enthroned him with the Black Vajra Crown as the Eighth Gyalwa Karmapa in Tsurphu. He studied with Tai Situ Rinpoche at Tsurphu Gon, and at the age of eight, also took up his studies with the First Sangye Nyenpa, Tashi Paljor, who had been appointed lineage holder by the Seventh Karmapa. Mikyö Dorje received the entire Karma Kagyu Practices and Whispering Lineage instructions as well as all essential empowerments from Tashi Paljor. When Mikyö Dorje was approximately eighteen years old, his root Lama Sangye Nyenpa Rinpoche passed into Parinirvana. 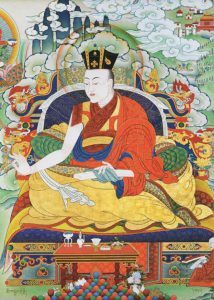 He continued his studies under other great masters, such as Dulmo Tashi Öser, Karma Trinleypa, and Dakpo Tashi Namgyal (lineage holder of the Drukpa Kagyu School who was renowned as both a scholar and yogi, and seen as an emanation of Gampopa). The Eighth Karmapa received an invitation to China when quite young, but declined, predicting the Emperor would pass away before he could arrive. His refusal offended the envoys carrying the invitation. They returned to China only to find that his prediction was correct and the Emperor had died. When the Emperor Wu Tsung sent the mission to the young Eighth Karmapa, the mission was attacked en route by over a hundred armed monks loyal to the Second Dalai Lama, Gendun Gyamtso. Mikyö Dorje was quickly taken to Central Tibet under armed bodyguard, for fear of assassination. Episodes like this demonstrate how Mikyö Dorje lived during periods of constant unrest. The Eighth Karmapa had many visions during his life that revealed his emanations to be inseparable from those of Padmasambhava, with both being manifestations of the activity aspect of all thousand Buddhas of this universe. He was indeed one of the most universal masters of all the Karmapas. He was also a visionary artist and founded one of the major schools of thangka painting, the Karma Gadri Tradition (others being the Mendri and the Mensar styles). Gyaltsap Rinpoche taught him how to paint in a distinctive style that was based upon such examples as the silk thangka given to the Fifth Gyalwa Karmapa by the Ming Emperor, the masks that originated with the miracle of the Third Karmapa’s image in the moon, and a Chinese thangka depicting the Sixteen Arhats of early Buddhism. Apart from being an accomplished meditation master and great yogi, he was also an eminent pandita and author of some thirty volumes covering a wide range of subjects. Some of his writings include some significant and authoritative treatises on the Shentong view, which he expounded and debated at length. He also composed many sadhanas and one of the main devotional practices of the Kagyu school, known as The Four Session Guru Yoga. The Eighth Karmapa’s foremost disciples were the Second Pawo Rinpoche,Tsuglag Tengwa and Könchok Yenlak. Realising his own imminent display of impermanence, Mikyö Dorje wrote a letter of prediction and gave it to Könchok Yenlak. He wrote: “In the life following this one, I will be born as the glorious, self-arisen lord (Wangchuk) of the world, in the upper regions of the snowy region of Treschöd, to the east, in a place where there is the sound of water and the Dharma is heard. I have seen the signs that it will not be long before I am born there.” His Holiness the Eighth Gyalwa Karmapa then entered Parinirvana. He was forty-seven years old.